Anti-Semitism is not a simple bigotry. It is a complex neurosis. It involves assigning malign intent to Jews where none exists on the one hand, and rejecting reason as a basis for understanding the world and operating within it on the other hand. John Kerry’s recent use of the term “Apartheid” in reference to Israel’s future was an anti-Semitic act. Leave aside the fact that Kerry’s scenarios are based on phony demographic data. 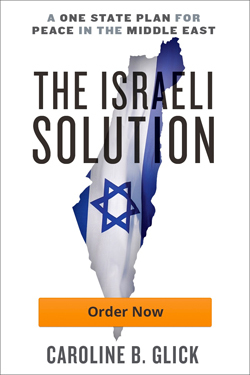 As I demonstrate in my book The Israeli Solution: A One-State Plan for Peace in the Middle East, Israel will maintain a strong and growing Jewish majority in a “unitary state” that includes the territory within the 1949 armistice lines and Judea and Samaria. But even if Kerry’s fictional data were correct, the only “Apartheid state” that has any chance of emerging is the Palestinian state that Kerry claims Israel’s survival depends on. The Palestinians demand that the territory that would comprise their state must be ethnically cleansed of all Jewish presence before they will agree to accept sovereign responsibility for it. In other words, the future leaders of that state – from the PLO, Hamas and Islamic Jihad alike — are so imbued with genocidal Jew hatred that they insist that all 650,000 Jews living in Jerusalem, Judea and Samaria must be forcibly ejected from their homes. These Jewish towns, cities and neighborhoods must all be emptied before the Palestinians whose cause Kerry so wildly champions will even agree to set up their Apartheid state. According to the 1998 Rome Statute, Apartheid is a crime of intent, not of outcome. It is the malign intent of the Palestinians –across their political and ideological spectrum — to found a state predicated on anti-Jewish bigotry and ethnic cleansing. In stark contrast, no potential Israeli leader or faction has any intention of basing national policies on racial subjugation in any form. By ignoring the fact that every Palestinian leader views Jews as a contaminant that must be blotted out from the territory the Palestinians seek to control, (before they will even agree to accept sovereign responsibility for it), while attributing to Jews malicious intent towards the Palestinians that no Israeli Jewish politician with a chance of leading the country harbors, Kerry is adopting a full-throated and comprehensive anti-Semitic position. It is both untethered from reason and libelous of Jews. Speaking to the Daily Beast about Kerry’s remarks on Sunday, State Department spokeswoman Jen Psaki was quick to use the “some of his best friends are Jewish,” defense. So in order to justify his own anti-Semitism – and sell it to the American Jewish community – Kerry is engaging in vulgar partisan interference in the internal politics of another country. Indeed, Kerry went so far as to hint that if Prime Minister Binyamin Netanyahu is forced from power, and Kerry’s Jewish best friends replace him, then things will be wonderful. In his words, if “there is a change of government or a change of heart, something will happen.” By inserting himself directly into the Israeli political arena, Kerry is working from his mediator Martin Indyk’s playbook. Since his tenure as US ambassador to Israel during the Clinton administration, Indyk has played fast and dirty in Israeli politics, actively recruiting Israelis to influence Israeli public opinion to favor the Left while castigating non-leftist politicians and regular Israeli citizens as evil, stupid and destructive. Livni, Olmert, Barak and others probably don’t share Kerry’s anti-Semitic sensitivities. Although their behavior enables foreigners like Kerry to embrace anti-Semitic positions, their actions are most likely informed by their egotistical obsessions with power. Livni, Olmert and Barak demonize their political opponents because the facts do not support their policies. The only card they have to play is the politics of personal destruction. And so they use it over and over again. This worked in the past. That is why Olmert and Barak were able to form coalition governments. But the cumulative effects of the Palestinian terror war that began after Israel offered the PLO statehood at Camp David in 2000, the failure of the 2005 withdrawal from Gaza, and the 2006 war with Lebanon have brought about a situation where the Israeli public is no longer willing to buy what the Left is selling. Realizing this, Barak, Livni and others have based their claim to political power on their favored status in the US. In Netanyahu’s previous government, Barak parlayed the support he received from the Obama administration into his senior position as Defense Minister. Today, Livni’s position as Justice Minister and chief negotiator with the PLO owes entirely to the support she receives from the Obama administration. Neither Barak nor Livni ever lost sight of the cause for their political elevation, despite their electoral defeats. Like Barak in Netanyahu’s previous government, today Livni provides Kerry and Indyk with “Israeli” cover for their anti-Israeli policies. And working with Kerry and Indyk, she is able to force herself and her popularly rejected policies on the elected government. Livni – again, like Barak in Netanyahu’s previous government – has been able to hold her senior government position and exert influence over government policy by claiming that only her presence in the government is keeping the US at bay. According to this line of thinking, without her partnership, the Obama administration will turn on Israel. Now that Kerry has given a full throated endorsement of anti-Semitic demagoguery, Livni’s leverage is vastly diminished. Since Kerry’s anti-Semitic statements show that Livni has failed to shield Israel from the Obama administration’s hostility, the rationale for her continued inclusion in the government has disappeared. The same goes for the Obama administration’s favorite American Jewish group J Street. Since its formation in the lead up to the 2008 Presidential elections, J Street has served as the Obama administration’s chief supporter in the US Jewish community. J Street uses rhetorical devices that were relevant to the political realities of the 1990s to claim that it is both “pro-peace and pro-Israel.” Twenty years into the failed peace process, for Israeli ears at least, these slogans ring hollow. But the real problem with J Street’s claim isn’t that its rhetoric is irrelevant. The real problem is that its rhetoric is deceptive. J Street’s record has nothing to do with either supporting Israel or peace. Rather it has a record of continuous anti-Israel agitation. J Street has continuously provided American Jewish cover for the administration’s anti-Israel actions by calling for it to take even more extreme actions. These have included calling for the administration to support an anti-Israel resolution at the UN Security Council, and opposing sanctions against Iran for its illicit nuclear weapons program. J Street has embraced the PLO’s newest unity pact with Hamas and Islamic Jihad. And now it is defending Kerry for engaging in rank anti-Semitism with his “Apartheid” remarks. J Street’s political action committee campaigns to defeat pro-Israel members of Congress. And its campus operation brings speakers to US university campuses that slander Israel and the IDF and call for the divestment of university campuses from businesses owned by Israelis. On Wednesday, the Conference of Presidents of Major American Jewish Organizations is set to vote on J Street’s application to join the umbrella group as a “pro-peace, pro-Israel” organization. Kerry’s “Apartheid” remarks are a watershed event. They represent the first time a sitting US Secretary of State has publically endorsed an anti-Semitic caricature of Jews and the Jewish state. The best response that both the Israeli government and the Jewish community can give to Kerry’s act of unprecedented hostility and bigotry is to reject his Jewish enablers. Livni should be shown the door. And the Conference of Presidents of Major American Jewish Organizations should reject J Street’s bid for membership.